Blues for Alice by Charlie Parker, bebop tune. Good one to know! This lesson probably is the most technically challenging music in a video lesson on this site, or at least up there. To make bebop sound right, you really need to make the notes flow in a smooth way. If you are just starting to play saxophone, this tune probably isn’t the best one to begin with. Part of getting that smooth sound is moving your fingers in an efficient way, like how Charlie Parker did. I try to move my fingers in that way and you’ll see in the video my fingers basically stay on the keys. 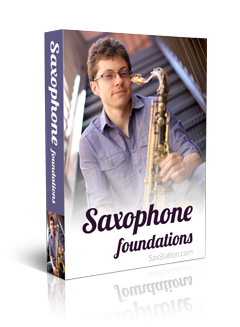 If you would like to work on your technique with me, check out Saxophone Tribe. Notes for alto sax below the video. On circular breathing, no, that’s not something I know how to do or am planning to learn right away.